In the past week, my partners and I have spent considerable time in our annual strategy session, laying the groundwork for the new economic cycle, the de-dollarization of the world. We flew to the turquoise waters of the Grand Cayman Islands to brainstorm and meet with a world expert on Artificial Intelligence, who has shown us a glimpse of what the largest tech companies are working on today, and it’s off the charts. The future holds in store maximum efficiency – we are all fortunate to be alive at this point in human history. June 1st marks the beginning of the Caribbean summer, so it is considered the wet season here, susceptible to hurricanes and storms, but we have enjoyed calm weather and sunny skies. On Wednesday, I scuba dived to a shipwreck, which the local government had bought from the U.S. in 2010. It was a submarine rescue vessel, whose original intent was to bring up to the surface the sailors of sunken submarines. They dropped her 70ft down, on the ocean floor for the purpose of turning it into an artificial reef, but a storm caused it to tilt over. When you scuba dive inside her many rooms, it causes dizziness for some, since it sits at a 60-degree angle. You must train your mind and prepare for these conditions beforehand. In the same way, our monetary system is tilted over, and if you’re not aware of it, you won’t enjoy the rewards of living in the 21st century. You’ll become dizzy, instead. We didn’t cause the economy to form on a weak foundation, but just like my wife and I had an amazing experience, during our 50-minute long dive of the Kittiwake, so can you become prosperous and wealthy in spite of this faulty fiat system. All you have to do is train your mind and prepare, accordingly. Financial education is the most important knowledge – money is the basis of everything in our society, and it’s a language that must be mastered. The day after, we set sail in a Catamaran and learned that the island is the result of tectonic plates colliding, causing a mountain of sand, rising from the ocean floor, with its top part peaking above water level. Residents are literally living on top of a sand mountain. Coral reefs protect it from the giant waves by blocking currents before they reach the shores. As we snorkeled in one of the reefs with stingrays and mating sea turtles, I thought of the essential role of the reef, often overlooked by the people, but ever important, just like the precious metals are against the underwater currents of inflation and fiat currency mismanagement. This is a tiny island, so from the sailing catamaran, you could see its four corners. Though it is so small, the microclimate is diverse. While one beachfront can enjoy the sunshine and clear skies, just ten minutes away, it could be pouring rain. In the investment world, this is referred to as low correlation – the possibility of two events occurring at the same time, though it seems impossible, since they are thought not to be able to co-exist – a rising USD and a rallying gold price is a prime example. Many do not understand how fiat currencies can even exist – a note, a government-backed paper, not fixed to any tangible asset, seems almost to be an insane idea, yet we’ve all used it for 47 years in a row. Just like with the weather in the Cayman Islands, decorrelation can persist for a long time, but once in a while, a hurricane blows over the entire region – no one is left unharmed unless he escapes the island in advance. This is what cryptocurrencies, offshore real estate, and true diversification allow, in the investment sense. A location-independent business (one that can be run from any place on the planet), achieves the same goal as well, since you can generate profits, regardless of your physical presence. A storm is definitely coming. 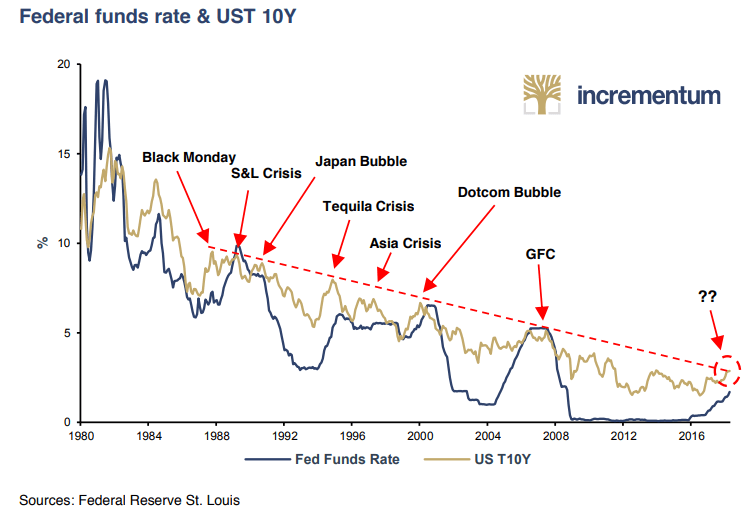 As you can see, when the FED Funds Rate catches up to the 10-yr treasury yield, a hurricane blows over, but just like the residents of the Cayman Islands, there’s no need to evacuate a sunny, beautiful place, if the danger is a year away. It will require 5-6 additional rate hikes to put us in the danger zone. Inflation comes first, then commodities start to rally, and only two years into a high inflation period, a recession hits. 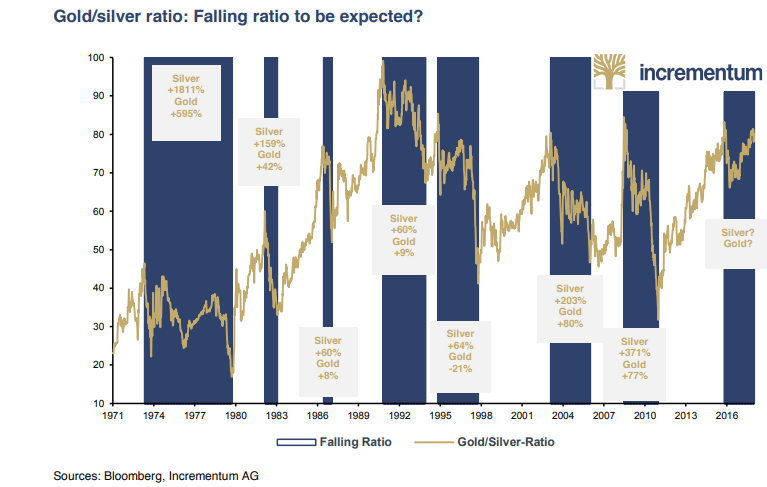 Silver last outperformed gold many years ago, close to eight years now, so this is a sign of inflationary pressures mounting. At the same time, record amounts of cash are invested in machine learning and super-computers, so these two industries, which are still in diapers, are set to make a historic rally. A MEGA-IPO is set for this Wednesday; so on Tuesday, Wealth Research Group will publish our most important alert since inception. Artificial Intelligence is at the heart of the new economy, coupled with de-dollarization: Get ready for both. BLACKOUT: U.S. Debt is China’s WEAPON!